FIFA 2014 World Cup, the 20th edition of FIFA World Cup is starting on 12th July 2014 . Here is the Fifa World Cup 2014 complete match schedule in Indian Standard Time (IST), that is GMT+5:30. There are 32 nations were participating in this biggest soccer event. Complete matches are scheduled between 12th June 2014 and 13th July 2014 (32 days). Here is the list of teams, who advanced to second round and list of teams, who knocked out from FIFA World Cup 2014. The teams in right column, highlighted with background-color were knocked out from FIFA world Cup 2014. And teams in left side column were advanced to Round of 16. There are thousands of websites were showing the match schedule but all are in Brazil local time. We found that many peoples searching the schedule in Indian Standard Time. And we written all in Indian Standard Time. 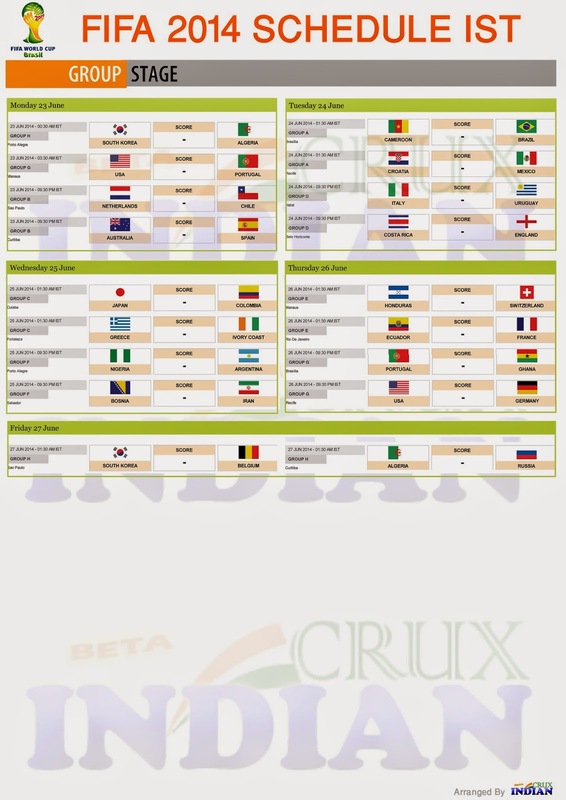 Schedule for first round, round of sixteen, quarter final, semi final and final are here in Indian Time. 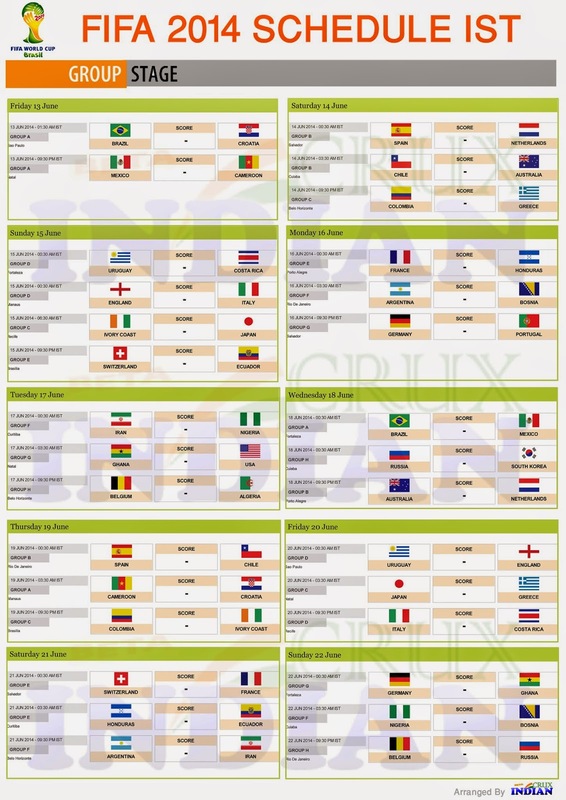 Fifa World Cup 2014 group stage matches, the first round of the cup, will play in league format. All teams are classified in to eight groups. Four teams in each groups and each teams will play against other threes in their group. To the second round of the FIFA World Cup 2014, 16 teams will advance from the first round after completing group stage matches. Two teams (winners and runners) from each group will reach the second round. The second round of FIFA world cup is called as Round of Sixteen. Fifa World Cup 2014 round of sixteen matches were scheduled between 28th June 2014 and 1st July 2014. The final match of FIFA World cup 2014 is scheduled on 14th July 2014 at 12:30 AM in Indian Standard Time. 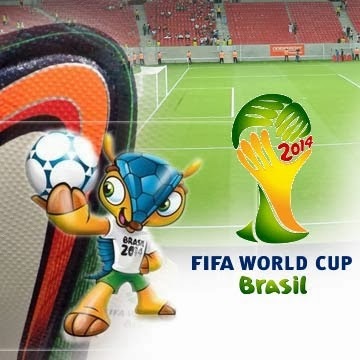 There are many sites listed FIFA world cup 2014 match schedule and all are written in Brazil Local Time, that is GMT-3:00. Indian Standard Time is GMT+5:30 and Complete match schedule listed here is in Indian Standard Time. Some matches will show one day later than listed in other websites, because in Indian Standard Time, those matches are after 12:00 am (Midnight). I written + between team names for few matches to avoid unnecessary repeats of ' V/S ', which will effect my SEO. I will publish the PDF version soon. Please visit my special blog on FIFA World Cup 2014.
could have been sorted by date time and weekend's being highlighted. Is this schedule made out of the assumption that IST = GMT + 5:30.. But it will be GMT + 4:30 now due to European summer time. Can you plesae check this? yahoo!! can't wait for this! Thanks Abdul for this much needed schedule list. PDF dll link not working???? hey, nice job man! i find it extremely helpful in planning my schedule..
BILLION OF POPULATION - INDIA SHOULD PARTICIPATE IN WORLD CUP. please mention Round of 16, QF and SF matches as A1 vs B2, A2 vs B1 etc . Please do not mention TBD. Hi Ashiq, There is some changes in FIfa Official site also. They were showing 58th match is playing before 57th match, I don't know why they giving match number like this. 59th is playing before 58th. I had noticed this deference even in 2010 fifa world cup. some match number where showing wrong. Thanks for your valuable comment, I re-written the schedule as your suggestion. Thanks, also inform us on Rules, regulations prescribed by FIFA for this Edition. Thanks Abdul for all your efforts. 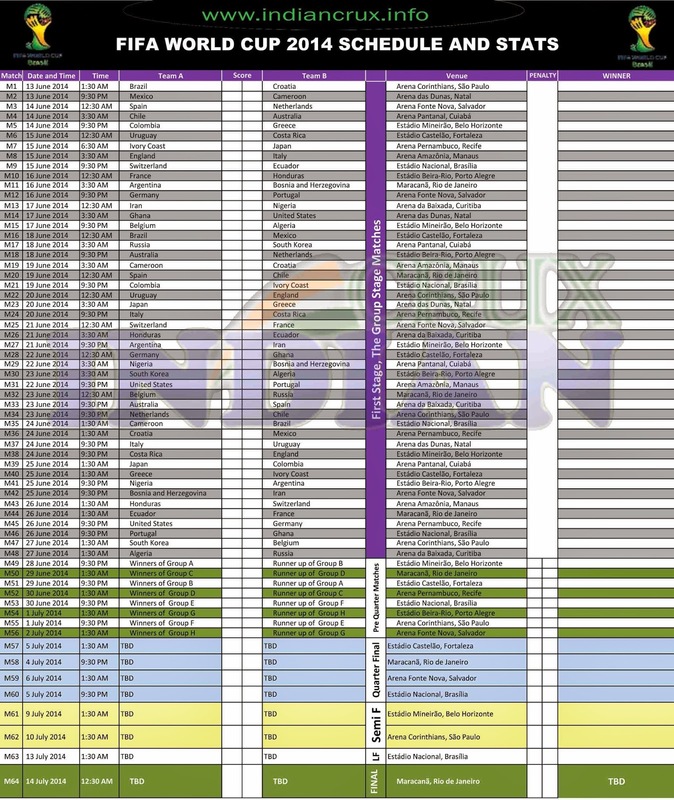 Thanks for share this chart for Indian time table format. ANY LIVE STREAMING WEBSITES YOU KNOW SIR? Abdul Bro ...awesome work..Thanks .. Please add "Day" column in the schedule. sure, i will try to cover more useful information about every sports. Can I get to know the full match highlights time as well. I am confuse of match 6 , it is post timing 6:30am, is it correct..? Hi, It is true Japan vs Ivory Coast match will play at 6:30am morning. Hi biswanath, The date and time are accurate and its only problem with match no. From FIFA official site and Wikipedia, i arranged the schedule order by the match no. But there is many confusions making this match number. You can see in Wikipedia The 20th match is playing before 19th. Because of the visitors confusion like you, i am re- arranging this schedule by match timing and note that i am not changing the match number. Now the schedule is not in order by match number. don't confused. This problem is also showing at match no 57,58, 59 and 60 from Quarter Final. 600K Visits, Thank you FIFA Fans from India.